The Managerial Aptitude Test can be used for graduate recruitment, recruitment for management, leader or professional roles, or for management development. The Managerial Aptitude Test would best suit the grade of a newly appointed graduate manager, an experienced manager or any more senior position involving the use or application of budgets, financial planning, policies or potentially complex procedures. The Managerial Aptitude Test is administered online via The Psychometric Portal®. Immediately after the candidate has completed the test, a report can be produced. The Managerial Aptitude Test can be administered under supervised conditions or remotely, online. If you have not supervised the candidate’s completion of the test, you may wish to use Validate at a later stage to verify the candidate completed the test without assistance. Already trained and certified in aptitude testing? 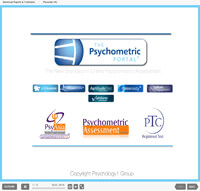 For those already trained and certified in psychometric aptitude testing, we recommend purchase of The Psychometric Portal®. Thereafter you pay a low credit fee per candidate for the test and report. Not currently certified in aptitude testing? No problem! One obvious choice would be to consider a Psychometric Test Training Course. This will ensure a through understanding of any aptitude tests you use as well as competence in the overall assessment process. Another choice is to have PsyAsia International’s Psychologists supervise the assessment process and reporting for you. Full details can be found in our Psychologist-on-Call™ Service.